Get ready as the new school year opens. Look fresh and get that clean, clear, soft and pimple free skin only at Toledomed Skin & Body Centre. Avail of Medicated Facial for as low as 150 pesos only from May 25- June 30, 2011 PLUS get a chance to win a Personal Care Kit in the FACE-A-HOLIC RAFFLE PROMO: BEAUTY FOR A CAUSE and a BRAND NEW LAPTOP in the Grand Draw plus other exciting prizes! 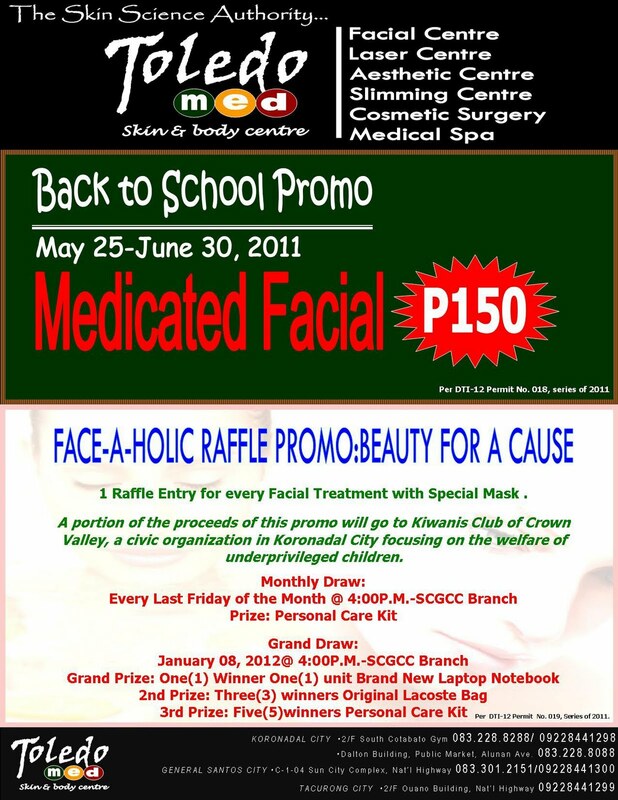 Visit Toledomed Skin & Body Centre in the ff branches now! 2/F Ouano Building, National Highway. Text 09228441299.